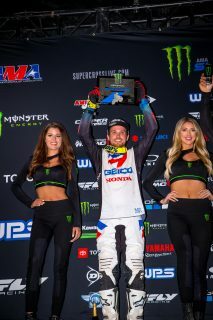 Round 13 of the AMA Supercross series, in Houston, marked the third and final Triple Crown event of the season, and while it was a rollercoaster night for Team Honda HRC, the squad was pleased to see Cole Seely put together his best event of the year to post fifth-place overall with 4-4-11 marks. 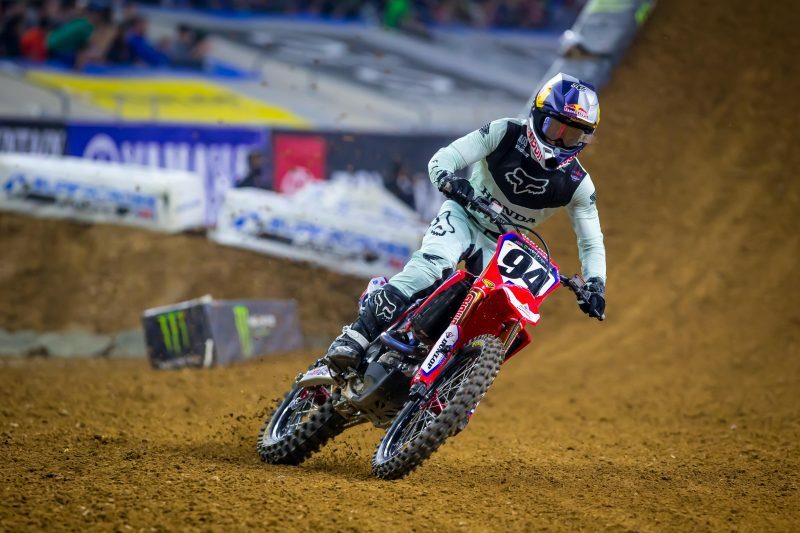 Teammate Ken Roczen experienced highs and lows throughout the night, notching 1-21-8 results for 10thoverall. In the night’s first of three 450SX races, Roczen grabbed the holeshot and early lead aboard his CRF450R, quickly pulling away from the rest of the field. 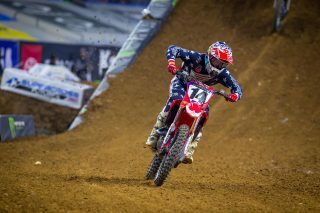 Seely also got off to a good start, sitting sixth after the first lap. The Californian worked his way into fifth on lap five before gaining one more position to take the checkered flag in fourth. Meanwhile, Roczen rode smooth and confident up front, leading the entire 16-lap race to take a convincing win. 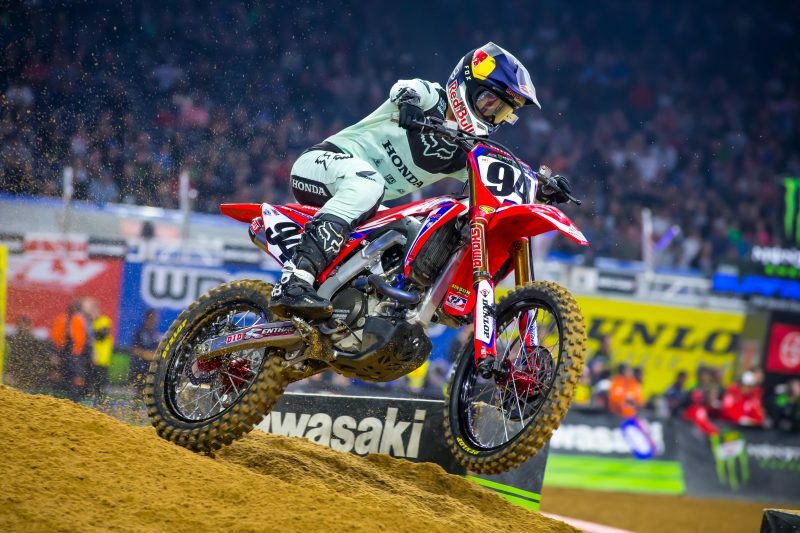 In race two, Seely came out even stronger, rounding the first turn in the top five and quickly moving into the third, then second on lap six. 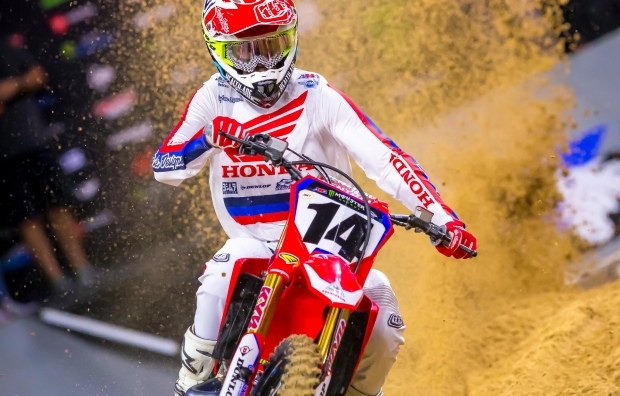 Through the final four minutes, Seely relinquished two spots, finishing in fourth. 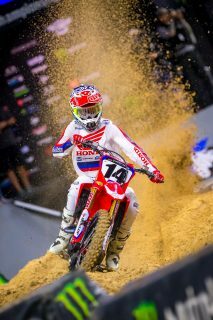 Unfortunately, Roczen got tangled up with another rider’s rear wheel in the first turn, sending him to the ground hard. 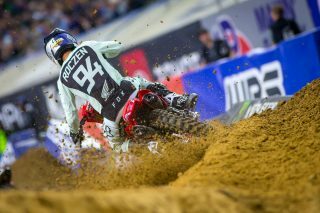 He remounted but was unable to complete the race. 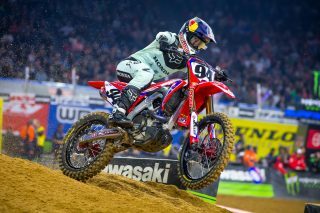 The German was quickly evaluated in the Alpinestars Mobile Medical, where it was determined there was no serious injury, and Roczen made the decision to line up for the third race. In that race, Seely scored a seventh-place start, with Roczen outside the top 10. 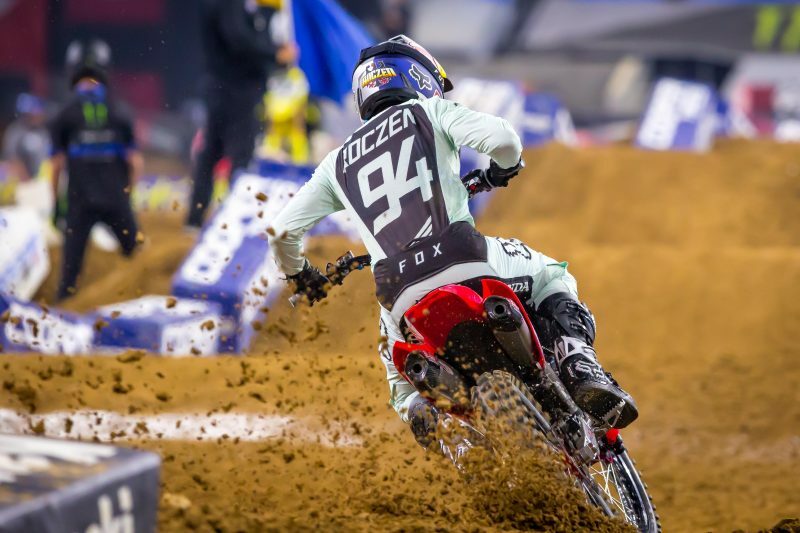 Seely lost several positions before a last-lap crash left him 11thon the night, while Roczen advanced, salvaging eighth place by the checkered flag. 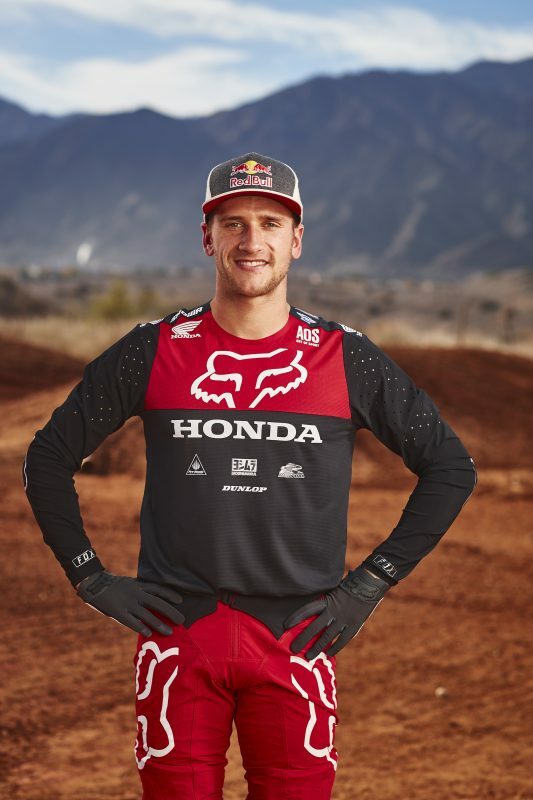 On Friday night, Team Honda HRC’s Ken Roczen and Cole Seely made their way to Wild West Motoplex in Katy, Texas, for a pre-race autograph session, where hundreds of fans came out to meet and get pictures with their favorite Red Riders. 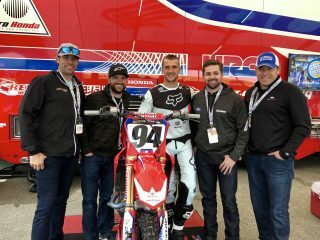 Also in attendance were GEICO Honda’s RJ Hampshire and Cameron McAdoo, as well as MotoConcept’s Mike Alessi and Ben Lamay, plus BWR Honda riders Tyler Enticknap, Carlen Gardner and Cade Autenrieth. The day started on a positive note, with Roczen dominating qualifying practice, securing the quickest time in both sessions and ultimately topping the field with his 47.386” lap time. 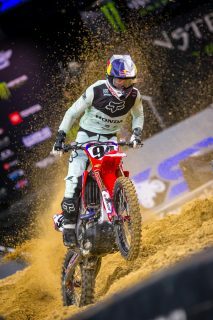 Seely also showed impressive speed early in the day, grabbing the sixth-fastest time of 48.082” in the opening session. 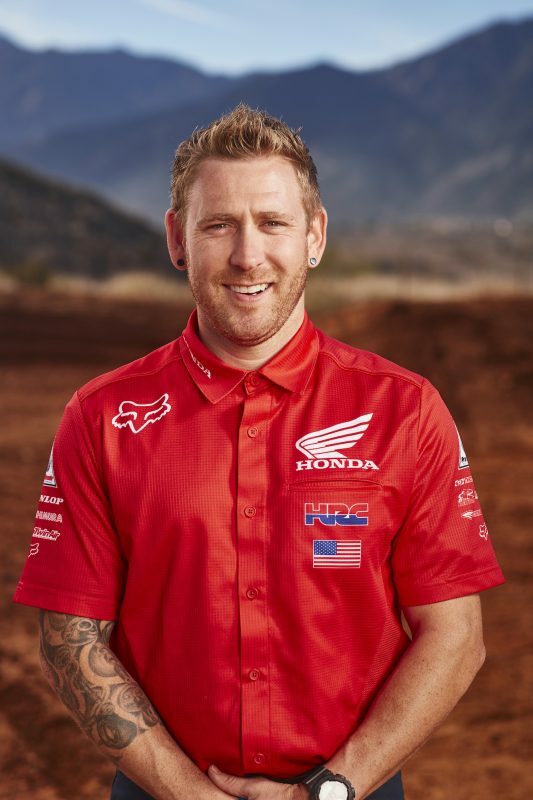 On race day, former Team Honda HRC racer and current test rider Trey Canard joined Jim Holley and Daniel Blair on RaceDay Live to chat about his new role with the team. 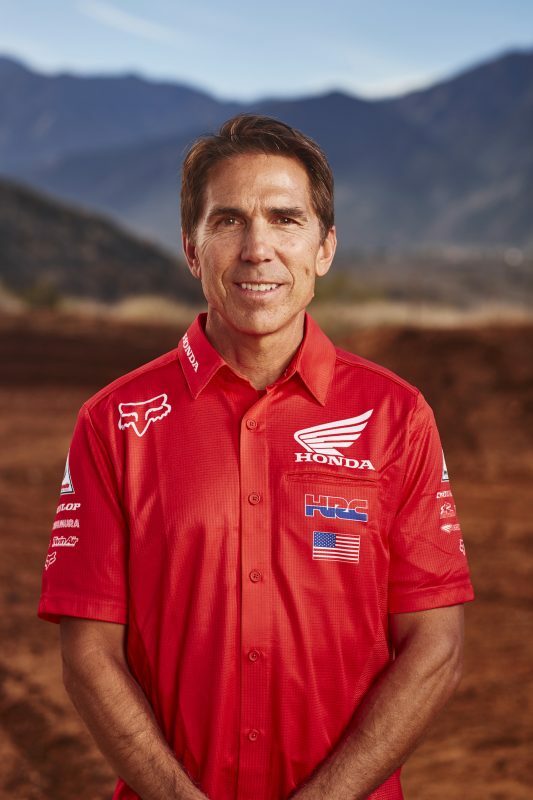 Then once practice had concluded, Seely also made an appearance on the show to discuss his 2015 victory in Houston and recap his comeback season so far. Before the night’s opening ceremonies, both Seely and Roczen got to meet NASCAR’s #17 driver Ricky Stenhouse Jr., who is a fan of the sport and flew to NRG Stadium Saturday morning to watch the action prior to his own race at Texas Motor Speedway the following day. Following the Houston round, Team Honda HRC said goodbye to longtime crewmember Jason Haines. 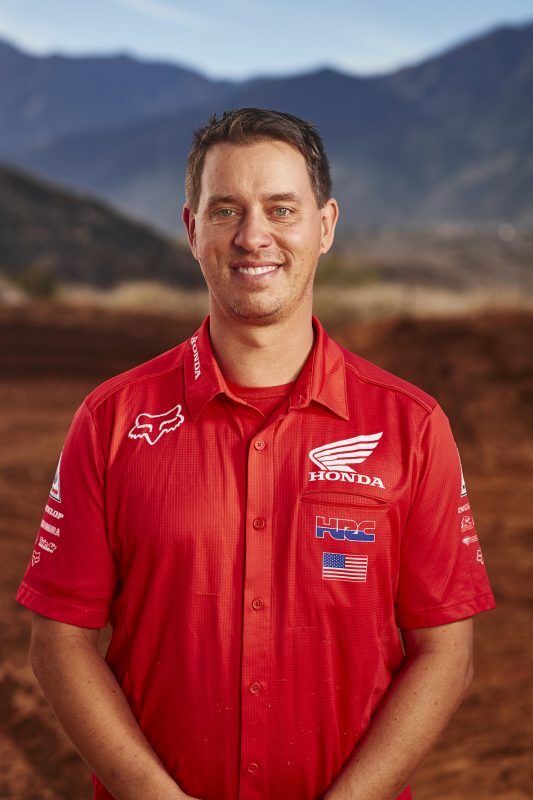 Over his 14-year career with American Honda, Haines wrenched for riders including Ernesto Fonseca, Andrew Short, Josh Grant, Justin Brayton and more before being named crew chief. 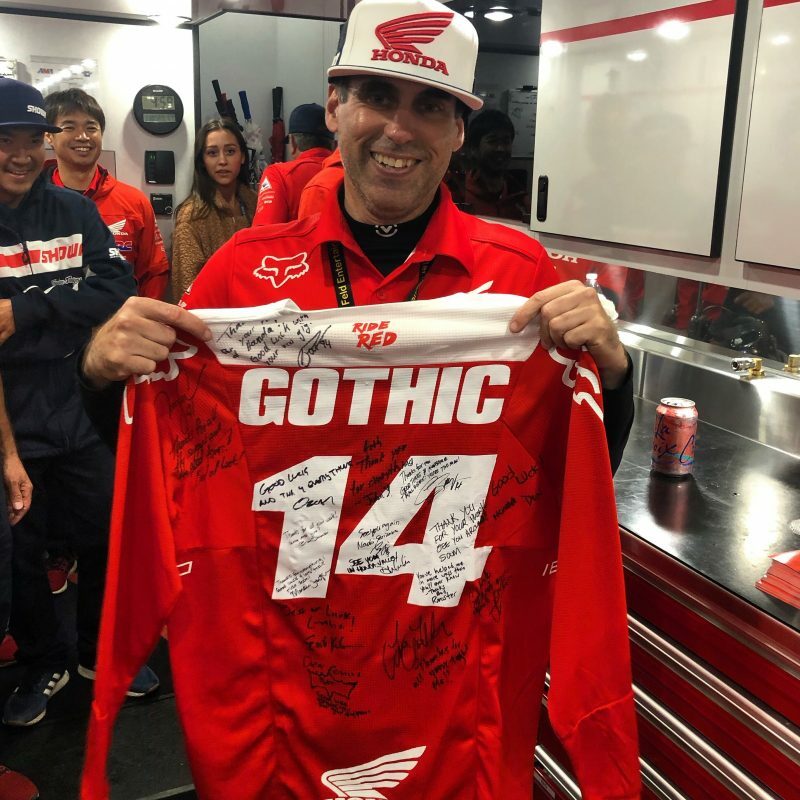 Before the night program, team members surprised him with a custom Fox jersey that was signed by the crew and riders as a token of their appreciation. Everyone at Honda wishes “Gothic Jay” the best in his future endeavors outside the motorcycle industry. 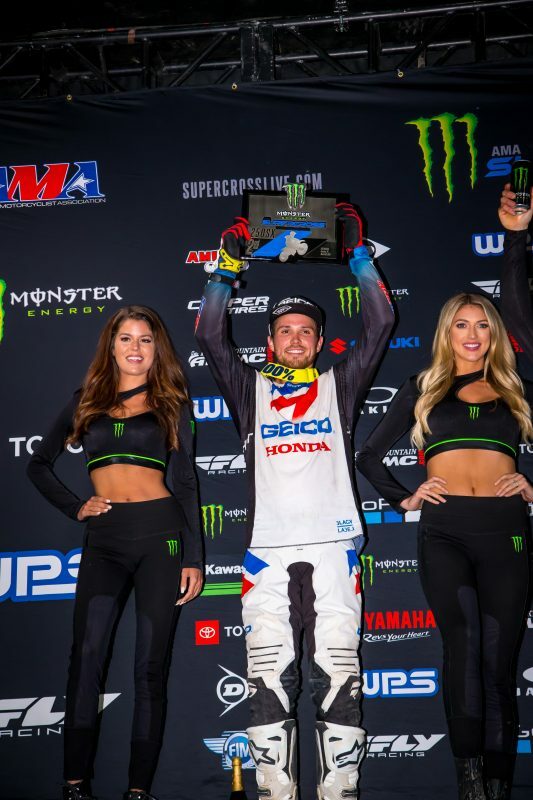 It was a stellar evening in the 250SX Western Region class for GEICO Honda’s RJ Hampshire, who rode consistently all night to score his first podium finish since his rookie year, with 3-2-4 marks for second overall. Teammate Cameron McAdoo also had a noteworthy event, finishing sixth overall with 9-6-5 scores. The two will have a one-week hiatus as the 250SX East Region class contests the Nashville round. Next, the series heads to Nashville for round 14. 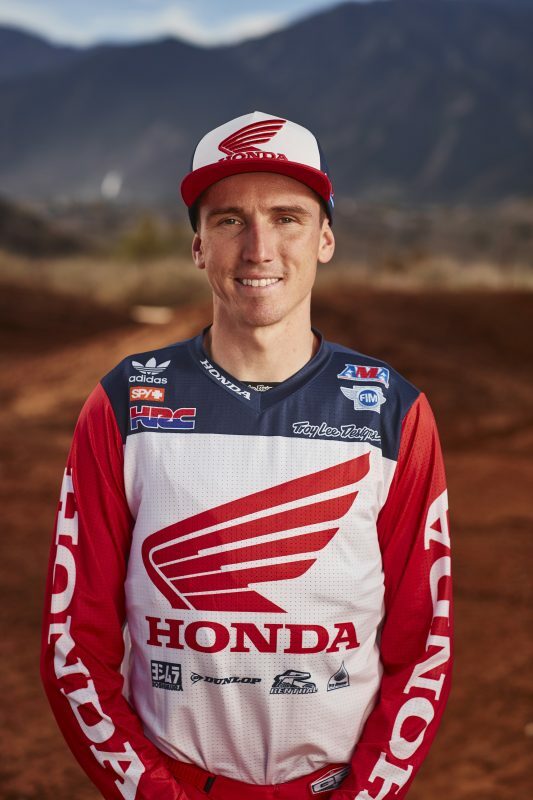 It will be a short week for Team Honda HRC, as Seely will participate in a local media tour on Thursday before he and Roczen get an opportunity to ride the track on Friday. Then Friday evening, Seely will be guest of honor at the Grand Ole Opry with his aunt Jeannie Seely, a country-music singer. “The first main event tonight was seriously so good! We grabbed a great start and got out front right away, pulling a 10-second gap on the rest of the field. 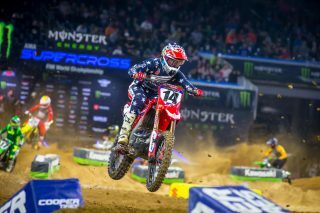 It was amazing to see the checkered flag before anyone else; unfortunately, it was only in one main. 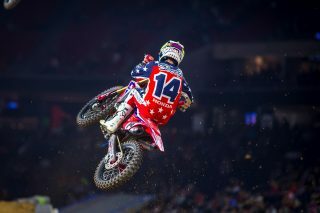 In the second one, I got tangled up with Dean’s [Wilson] rear wheel and went down pretty hard. I smashed my toe and originally thought I had an ankle injury but luckily that wasn’t the case. 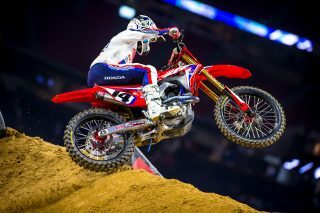 My bike was also so bent up after the crash. I got checked out and it actually started to feel better, instead of worse, after 15 to 20 minutes. That was good but my toe was still in a lot of pain. Luckily I was able to just jump back on the bike and do what I could in the third main, salvaging an eighth-place and getting 10th overall. It’s not really how we wanted to end tonight, especially with how well the day and first race went, but again we’re healthy and moving on to the next one. At one point, it will come.